It’s that time of year again when the seniors I teach are in that bittersweet time; they’re happy to be moving on but sad to leave some things behind. They’re distracted by plans for the future but also trying to live up to their many commitments. As their teacher I often wonder whether the things we do in my classes has value, if I’ve prepared them enough for “life after high school.” So I thought it might be an interesting idea to catch up with some of our former students to see how their first year is wrapping up. Was college all they dreamed it would be? Is it better than they imagined? not quite as good? Did the kind of work they did on Youth Voices, the digital compositions and the collaborative writing, prepare them for the kinds of things they’ve been asked to do this year in college? Judging by the 2010 Horizon Report, I think we’re on the right track, but there’s only one way to find out. We were also joined by Jimin who blogs regularly at Crunchgear in addition to being a student at NYU. Last year Jimin wrote posts like All Your Intellectual Property Are Belong to Us, It’s Not Fair, It’s Laissez-Faire!, and used Youth Voices as another way to promote his band Illegal Beagle. This episode of Teachers Teaching Teachers, was recorded during a live webcast back in the middle of February. 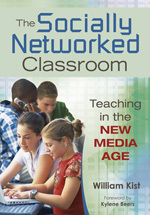 We think you will enjoy this conversation with William Kist and Mike Slowlinski, one of the teachers who is featured in William Kist's new book, The Socially Networked Classroom: Teaching in the New Media Age. Troy Hicks has a thought-provoking question to ask toward the end of this podcast as well. Get the book, and learn along with all of us. William Kist is an associate professor at Kent State University, where he teaches undergraduate and graduate courses focused on adolescent literacy. He has been a middle school and high school English teacher; a Language Arts and Social Studies curriculum coordinator; and a consultant and trainer for school districts across the United States. Kist has over 30 national and international conference presentations and 10 published articles to his credit, including his book The Socially Networked Classroom: Teaching in the New Media Age (2010, Corwin Press.). In addition to his work in education, Kist has worked as a video/film producer and musician. Kist is editing one independent feature film, Summer’s Journey, and is developing his original screenplay, Field Trip, to be filmed as an independent feature in 2008. This podcast is another in a series of Teachers Teaching Teachers shows to feature the authors of a recent outcrop of books on new media and literacy (Using Technology to Improve Adolescent Writing: 186. Copyright Clarity: 184, 135, The Digital Writing Workshop: 172, 171, 170, Teaching the New Writing: 157, 156, 155, Teaching Writing Using Blogs, Wikis, and other Digital Tools: 138) Perhaps we have the makings of a new discipline here, or at least a budding new branch on the tree of academic inquiry. See the National Writing Project's list at Teaching Now: Digital Writing Books. What would you add to this list? Let us know by adding a comment below. Dave Bill introduces us to TEDxNYED. "TEDxNYED will be an all day conference designed to examine education and the impact of new media and technology. Speakers are challenged to share innovative insights and inspire conversations about the future of education. Attendees are challenged to rise to the occasion: learn for themselves, educate each other and, following the spirit of TED, spread these ideas."